Iran holds the world’s fourth-largest proved crude oil reserves and the world’s second-largest natural gas reserves. Despite the country’s abundant reserves, Iran’s crude oil production has substantially declined, and natural gas production growth has been slower than expected over the past few years. International sanctions have profoundly affected Iran’s energy sector and have prompted a number of cancellations or delays of upstream oil and gas projects. International sanctions have stymied progress across Iran’s energy sector, especially affecting upstream investment in both oil and natural gas projects. – Iran’s crude oil production fell dramatically from nearly 3.7 million barrels per day in 2011 to 2.7 million barrels per day in 2013 because of sanctions. – Iran trades marginal amounts of natural gas regionally via pipelines. In 2013, more than 90% of Iran’s imports came from Turkmenistan, and more than 90% of Iran’s exports went to Turkey. Iran does not have the infrastructure in place to export or import liquefied natural gas (LNG). – Iran’s increasing domestic demand for electricity has created supply shortfalls during times of peak energy demand. Iran recently increased electricity prices, which is a component of its energy subsidy reform, in hopes of limiting demand growth. 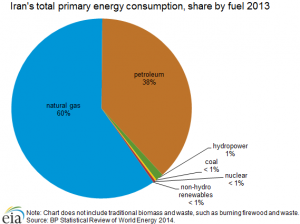 Natural gas is the country’s primary fuel source to generate electricity, accounting for almost 70% of total generation in 2013.